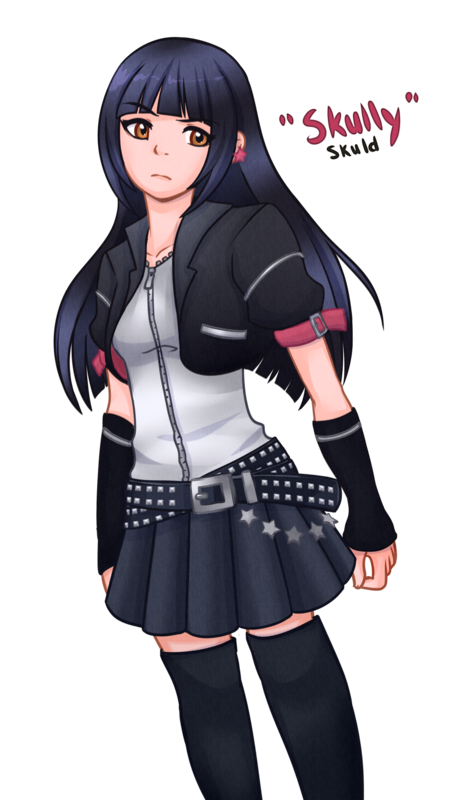 Skuld is the best dressed character in Kingdom Hearts. How great is Skuld's outfit? I will fight you over this. Belts? Check. Zippers? Check. Chain? You bet. I'm really impressed you already made some art of her, this has to be a world record. And here we thought Nomura had moved on from those in his most recent designs. LOL. Apparently not! Also, why do I get the feeling that everyone's going to pair her up with Riku now? 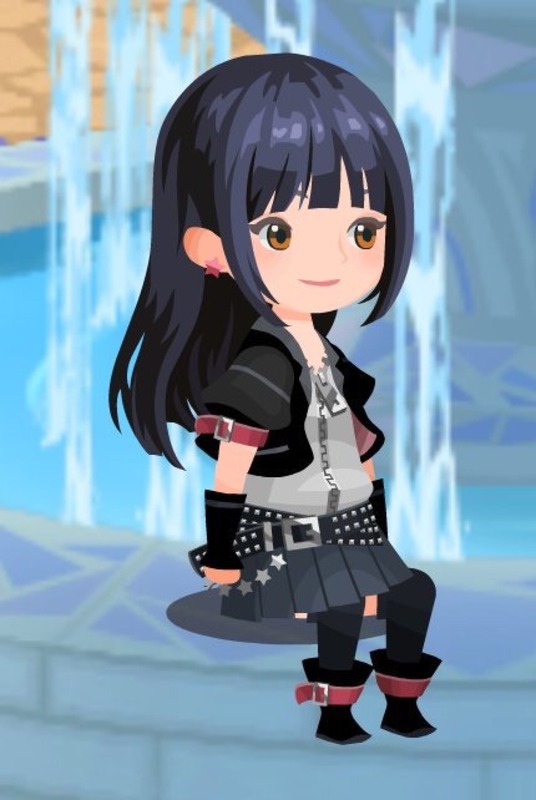 Because they're both "emo", and because Riku's KHII design (that he no longer has) would maybe pair well with Skuld's? I swear that Riku gets paired with every new girl this series introduces, and it never ends up going anywhere at all. LOL. It's like Nomura's aware of it all and trying to spite the fans' wishes (or not get sued by someone saying "he stole my idea!"). LOL. Edit: Is anyone else getting a major Homura Akemi vibe from this girl? Love her design and I wonder if she intentionally is meant to draw on Sora in the way Ephemera drew on Xehanort? The weird half worn belt in no loops, the chain on the side composed of stars (Sora's was crowns I wonder if that means Stars are Skuld's symbol), and the weird onesy that has a zipper going from the crotch all the way upward. Also her colors scream KH3 Sora and even those strategically placed red sleeve belts give her sleeves the same red ringed edges as KH3 Sora's sleeves. Skuld does look pretty good. All these new guys have, lately. Oh, and she gets infinite bonus points for having brown eyes. skuld why i think she will have an importal role in the whole series? You know what's really crazy? Skuld reminds me a lot of a character from my own thing. Beauty mark, long black hair, miniskirt. Because she is one of the witches of destiny...well...best to read up on Norse mythology! Nomura dragged Norse mythology into this? I'm okay with that and I'm not okay with that. Norm... oh wait, do you mean the Norns? ... Hm, they seem like the Norse equivalent of the Fates, minus the string-spinning thing. So are we going with a theme of fate and destiny now? If that means we could possibly have some "Magnus Chase" stuff in later installments, I'm completely down for it. LOL. Edit: Also, BlackOsprey, FFXIII somehow had two people who were thousands of years old with the rest of the main cast, so you never know with Square. LOL. Not that I want Riku to be paired with Skuld (because it makes absolutely no sense), but I know parts of this fandom too well. Shippers will ship, and people love their crack pairings. LOL. ANYWAY, I'm so happy at the idea that we might even be getting TWO NEW female characters on top of Skuld! -sobs in a corner happily- And not only that, but that Nomura's maybe breaking his norm of boy-girl-boy trios, and that we might even have some girl-girl interaction going on for a change.